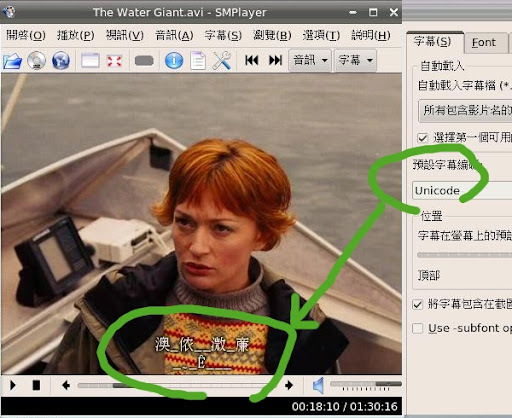 最近找到了 SMPlayer 一舉解決所有問題 (雖然我的 MPlayer 還是無法使用), 幾乎我經常遇到的影片格式都能支援播放, 唯一的缺點是都需要外插字幕時, 往往會出現亂碼. 因為在 Windows 上使用 Media Player Classic 時也遇過一樣的問題, 當時是因為字幕檔的編碼問題, 改成 Unicode 就 ok, 因此在這裡也以為是同樣的問題, 但總是嘗試不成功. 今天無意中發現在 SMPlayer 的 option ( 選項 ) 內有 Preference ( 設定 ) 可以調整字幕, 在 Subtitle ( 字幕 ) 頁面中可以調整 Default Subtitle Ecoding ( 預設字幕編碼 ), 只要調整到原本的字幕檔編碼就 ok 了, 比起要改變字幕檔編碼是來的容易多了. 話說回來為什麼我們一般使用者需要關西這種編碼的問題呢 ? 就像我們跟本也不關心在 network 上 packet 是怎樣用甚麼格式被封裝, 怎樣被解封裝, 影片的字幕問題也應該被 "embed" 在影片播放行為之下才對. 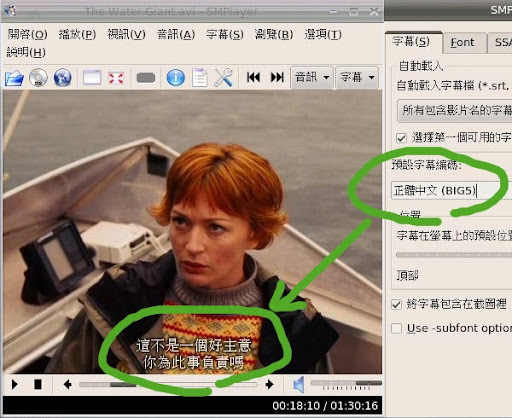 對於播放 DVD 影片光碟來說是這樣, 在 PC 上播放也應該是這樣吧. This entry was posted on 下午2:06 You can follow any responses to this entry through the RSS 2.0 feed. You can leave a response, or trackback from your own site. 我知道 SMPlayer 的後端其實還是 MPlayer, 不過很奇怪的在初始安裝的設定下我的 MPlayer 就是沒辦法用, 加上不理解怎樣作相關設定調整, 倒是 SMPlayer 一裝上去就 ok 了 @@ 不知道在 SMPlayer 內引用 MPlayer 時, 是否有對 MPlayer 做什麼額外的設定改變 ?